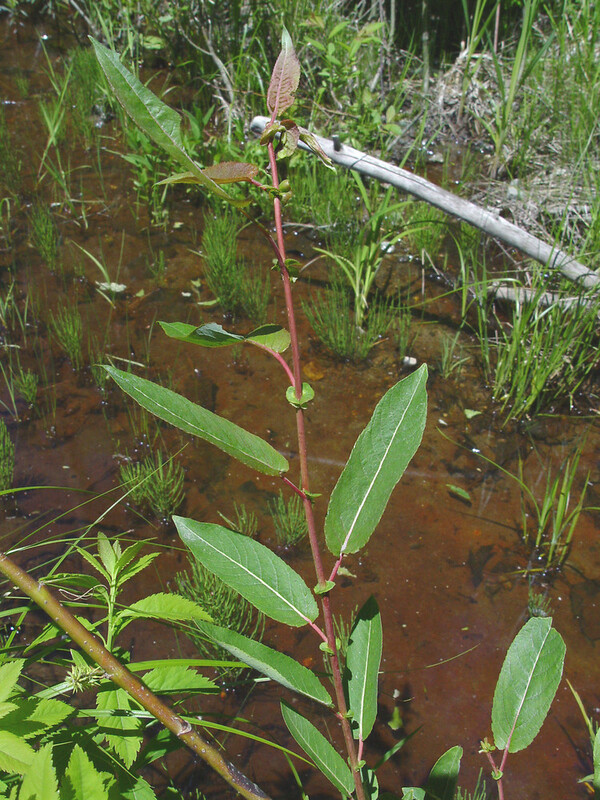 Salix eriocephala. By Donald Cameron. Copyright © 2015 Donald Cameron.New England Wild Flower Society.gobotany.newenglandwild.org. (Accessed 5/2015). Salix eriocephala is a stout shrub or small tree 2-12 m tall, usually multiple with stems, new growth pale green, densely wooly-hairy, older twigs brown, stipules crescent-shaped, 0.5-1.5 cm, persistent, like those of S. nigra. Leaves alternate, stalk to 1.4 cm, blade 7-15 cm long, 2-4 cm wide, oblong to lance-shaped, tip pointed, base rounded to slightly lobed, dark green above, whitish, hairy on veins below, hairy above when young, older leaves stiff, veins conspicuous, margin toothed. Flowers dioecious, catkins 2-5 cm long, blooming about as leaves emerge late March-May. Fruit dry capsules 0.4-0.6 cm long, narrowly egg-shaped. Habitat: Wet open meadows, steam banks.